In 1962, Kumon volunteered its services to a children's home in Osaka, beginning the implementation of the Kumon Method in places other than Kumon Centers. 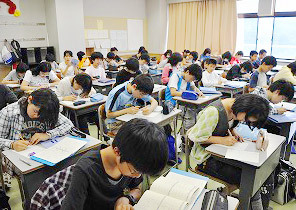 Now, Kumon is being used in over 80 children's homes and a number of senior high schools. Staff members at children's homes use the Kumon Method to help children cultivate self-acceptance. School teachers aim to find concrete solutions to their students' diverse academic issues using the Kumon Method. These efforts have yielded a large number of positive results. The road to independence becomes harder for the children of children's homes if they are unable to pass entrance examinations for senior high school due to a lack of academic ability, or if they drop out of senior high school. Wishing to help these children acquire the necessary academic skills and achieve their desired goals in life, Hofu Kaihokuen decided to implement the Kumon math program at their children's home. 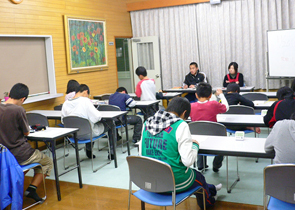 Currently, approximately 30 elementary and junior high school students do Kumon worksheets at a fixed time after dinner, five days a week. All of the staff members collaborate to instruct these students. Looking around the children's home, we see one student working hard to complete his worksheets, while another is arranging her completed worksheets nicely and then presenting them to staff members using both hands as a sign of respect. As a result of acquiring a positive attitude toward learning and a firm foundation of academic ability, children gain great confidence in themselves, saying such things as, “I'm number one in math!” Such confidence also has other positive effects on their daily lives. As a result, they are able to enter the senior high school of their choice. Kumon Kokusai Gakuen aims to develop individuals who can play active roles as leaders in various fields in global society. As one of their main educational programs, students study with Kumon either in the morning or after school. Through their learning, students obtain not just academic ability but also self-learning ability, which enables them to think for themselves and make their own decisions. Students retain this sense of self-reliance and thirst for learning throughout their lives. After graduation they go on to fill key positions in society.